There are many factors that go into defining our achievement. You should have a solid skillset and business expertise. One of the key ways you can develop this knowledge and these skills is by making mistakes. As we reflect on these mistakes we grow and know what to avoid in future. Mentorship allows you to go deep and grow fast. There are great resources available through conferences, podcasts, blogs etc. 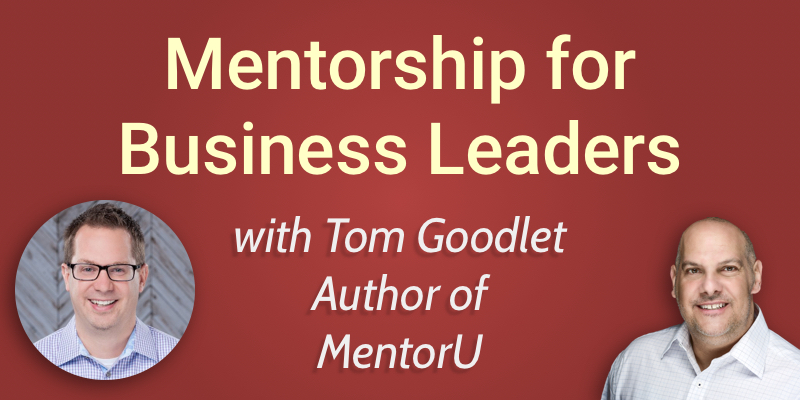 but with mentorship, you hone in on the mentee and you can be lazer-focused on their growth. It’s an efficient way to learn and grow because the topic is ‘you’. You get a sense of accountability. You have somebody to discuss mistakes made and learnings that come from business experience, dissect what has happened and learn from it. Being held accountable to your goals and actions keeps you focused on growth and the ability to analyze and reflect on mistakes helps you to learn. If your mentor gives you some advice that you can’t see the value in yet, it’s importance to trust the guidance of your mentor. How do you set up a good framework to grow your career? And what steps do you need to take to keep moving towards your career vision? 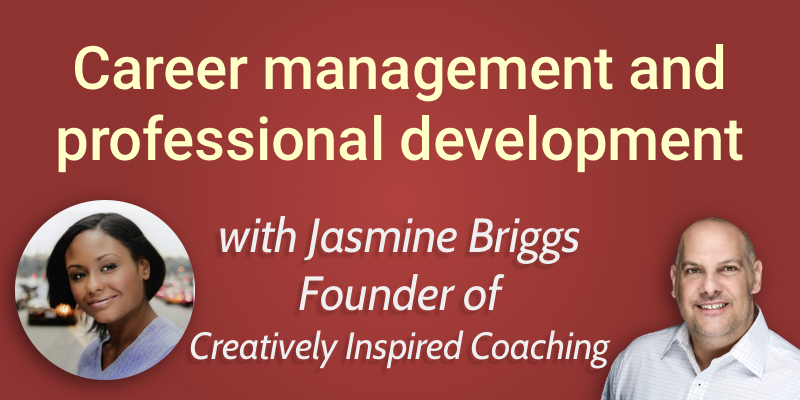 We speak with Jasmine Briggs, a New York based Career Coach, who walks us through the process of setting up goals that enable constant growth and development in our careers. How important is good career management to the success of professional development? How do you set up a good framework to help your career grow? 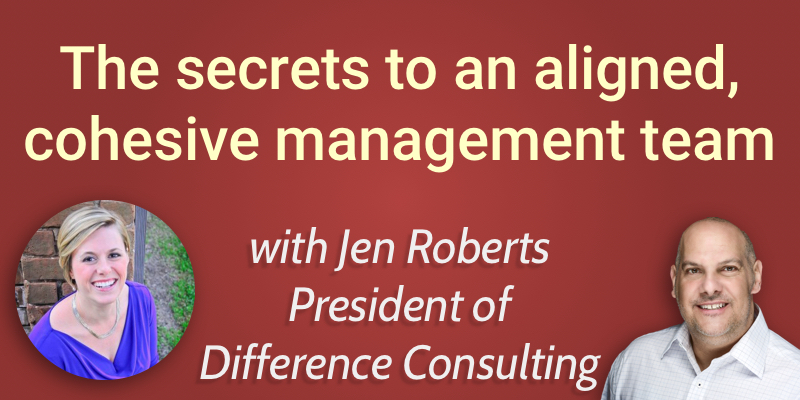 What is the biggest misconception in career management? How do you know when you are on the right career path? One of the things I notice is that when I engage with folks, they seem to be more goal oriented. And don’t get me wrong – I encourage people to have a personal vision and goals. Goals to reach their vision and plans to reach their goals. But one of the things I’ve noticed is that when the goal is completed it take a long time to develop another set of goals. In our busy lives as leaders, it takes us a while to get back to goal setting. Where individuals fail to get back into their personal development – this is where boredom and complacency grow. So now that we’ve spent the time to develop, what’s the best way to market our talents? And how do we take all that expertise and use it to have successful career management? I wanted to find somebody that was going to be able to give us some guidance and tips on good career management. So our guest today is Jasmine Briggs. She is a Career Coach, with an extensive background in recruitment, workforce development, staffing and career counselling. She works with professionals around the country on developing their dream careers. Jasmine’s expertise is in career exploration, setting career goals, and employment search techniques. Very important. Jasmine notes that we’ve moved away from a time where companies manage our career so that we have to manage it ourselves. We must avoid leaving our careers on autopilot by setting growth goals in terms of where we see our careers going and the steps we need to take to get there. Of course, as leaders, we must be invested in our workforce to help them be successful in their careers, but it’s important to remember that our first employee is yourself and that should be our first priority. It starts with an exploration of what is important to you and what you want to contribute to the world, says Jasmine. Once you know what you’re looking to contribute, you can then turn that into an overall vision for your career. And once you have a vision, you can’t leave it stagnant – you must check in with it every six months or so to make sure that the vision hasn’t changed. Or if it has changed to update it to where you are right now. Our environments are constantly changing, so it is important to always be revisiting your vision to ensure it is relevant to you and your current position. Jasmine advises starting with a check-in date. This is an opportunity every three to six months to check in with your vision, looking at your career goals, and seeing what steps you need to take in order to align with those goals. It’s about constantly being engaged with your career, your network, and your industry. By keeping up with how the industry is changing and how you are personally changing and developing professionally, you can see opportunities to market yourself and show yourself to be an expert in your field. A strong professional network is vital to career management and progression. Having someone available that has a pulse on what’s going on in the industry and someone you can look to for advice is extremely valuable. You want to have mentors within and outside of your company. Personal development, learning soft skills that assist in your career, are very important, says Jasmine because people hire people. When Jasmine does training sessions with clients, she tells them that she can train them to do anything, but she wants to hire someone that she can spend 8+ hours per day with. So by developing soft skills like emotional intelligence and leadership skills, it helps to connect with people, which contributes to their decision making, allowing them to trust you in leadership roles within their organisation. Jasmine believes that the biggest misconception is thinking that you don’t have to consider career management – that your career will naturally flow. It’s about not only setting goals but speaking up about it. If nobody knows that you are looking to grow then nobody is going to notice! Sharing a desire to take development courses, a desire to take responsibility for a project – these are important things to share to allow yourself the opportunity to move your career forward. Secondarily, sharing this intent with a manager also gives you an accountability partner, which is really important in being able to reach those goals. Jasmine encourages people to check in with yourself. Being self-aware, thinking about your current state and where you would like to be. If you are on the fence about your current role and whether to go for that next position, Jasmine says go for it. It’s through that process of going for the next position that you learn the skills and get the experience you need to continue to grow. And by going through that process of building your skills, you’re growing your network. Build yourself on LinkedIn – perfect your profile and build an engagement strategy where you are posting and interacting with the community and building your network. Do some self-exploration to identify your top strengths and weaknesses and identify areas where you would like to grow and develop through training. Continue to network – within your company and outside of it. At the end of the day, it’s about who you know and the best way to get into a new company is through a referral. As business leaders, we do a lot of coaching. But there’s a growing number of people out there that are taking their leadership skills and moving into the business of coaching. One of the things we hear all the time is leaders wanting to know how they can use their experience and expertise and learn the skill of coaching. Traditionally, coaching has been a face-to-face interaction, but with the rise of online communication and video conferencing, many coaches are moving their businesses online. 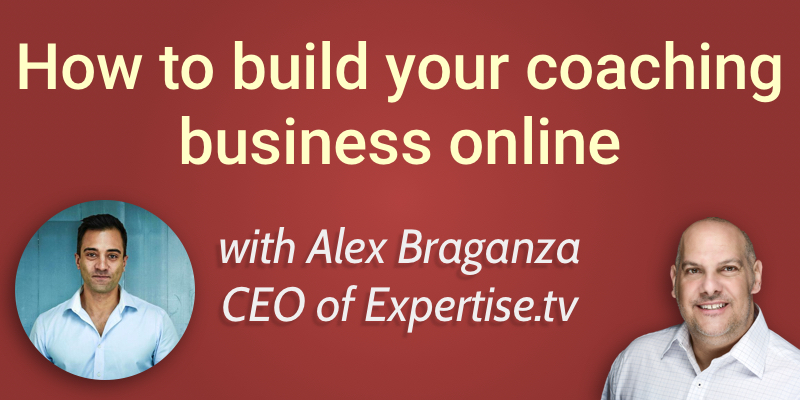 But how do you build a coaching business online? Where do you find new clients, how do you communicate with them and nurture a valuable relationship without ever meeting in person? To answer that, we’ve brought Alex Braganza on the show. Alex is the CEO of Expertise.tv, a video platform that enables anyone, anywhere, to access the best experts globally. 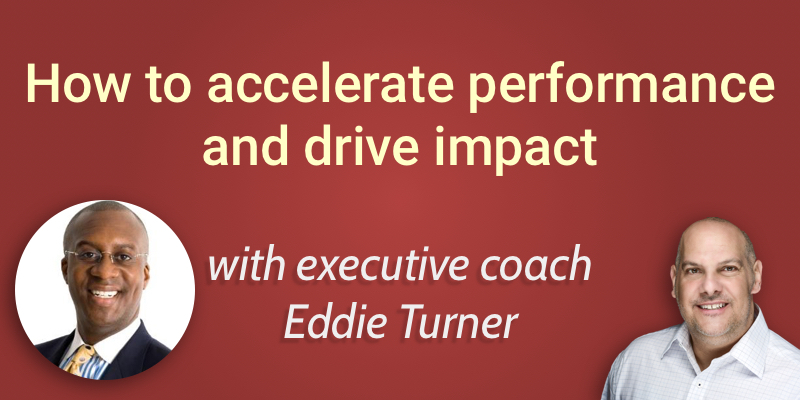 They help business leaders build and grow their coaching business online. Alex has spent the last 15 years building businesses in the emerging markets including Hong Kong, Dubai and Mumbai. His experience of being away from his hometown of London has highlighted the difficulties of finding expert advice when there are limited providers physically close to you. From this frustration, the idea of Expertise.tv was born and he’s on the show today to share his insights with us. The range of people you can reach and communicate with is far greater online, which is one of the biggest advantages of going digital. Until recently, reaching an audience of this scale was only available to large companies with marketing and technology budgets to match. Alex says one of the most common misconceptions he sees is that as a historically face-to-face business, coaches believe that they won’t find clients on Facebook, Instagram or other social media platforms. It’s not just about LinkedIn, he says – these other platforms are so ubiquitous that they all offer unique opportunities to connect with your prospects. You may have a great reputation in your local area – where you’re based geographically – but online you need to be able to build that same reputation and trust with the community. And the best way to do that is by creating valuable content. The internet is a noisy place, so in order to stand out, Alex says you need to clearly identify your ideal client. Who is the client that you can help the most with your coaching? And what is the biggest problem that they have? Find a problem that your ideal client thinks about frequently in their life and career, and focus your attention on creating content around that specific subject. Once you have that content available, it’s about distributing it to the people that are looking for that sort of help. And that’s how you begin to build your audience. Over time you will build trust with this audience. As the advice you are offering through your content has a positive impact on their lives, they will start believing in you and your ability to help them and will be very keen to develop that relationship with you. At that point, it’s about having the correct systems in place that make it easy for them to take the next step in becoming your client. What type of content should a coach produce? Alex’s thoughts: It’s all about starting. He sees the biggest hurdle as just that – getting started. When starting out you should pick the medium that you are most comfortable with and go with it. That may be video for some or blogging or podcasting for others. Once you begin to build a body of work in one medium and you are comfortable developing content regularly (Alex recommends putting a piece of content out twice a week), you can build on it and branch out into others. How do you get your ideal client to find the content you are producing? Alex highlights 2 main approaches to distributing your content online, depending on the speed of the results you want to see and the resources you have available to achieve them. By using paid campaigns on LinkedIn, Facebook or other platforms, you can target groups based on the influencers they are following. By targeting relevant influencers, you can determine that their followers are likely to be interested in your content. Alex says that the most compelling content that gets the strongest conversion rates online is live content. The idea that people can watch you live has got magic to it that other formats lack. It’s been true for many years and is still the case. People are curious to see what will happen on a live event and are excited to be able to interact and ask questions live. Other organic methods of driving traffic to your content include posting answers to questions on Quora – a popular help forum where people ask for expert advice on many topics. This takes time to build a reputation and see increased traffic to your website or content. How much time do you need to launch a webinar? Once you have the webinar written and prepared to present, you can expect to get a big enough audience with a paid campaign within a week to two weeks. You can expect attendees to be registering from day one of a paid campaign. The total time needed will be dependent on your budget spend on the social campaigns driving traffic to the registration page. If you’re launching the campaign from an existing email list that you have built up then you could only need a week to get enough registrations. If you are driving organic traffic to your webinar then you will need to plan at least a month before the actual live event. Across the board, Alex says, around 30% of webinar signups attend the live event. Meaning aiming for 5-10 attendees in your first few webinars means attracting 20-30 signups. Because every new connection can lead to opportunity. At the beginning, you should be planning on presenting to only a handful of people for each webinar. You should treat your first three webinars as your training ground. Use them as an opportunity to practice delivering the content, to learn which topics work and which don’t. Using this chance to hone your delivery is important as your audiences start to grow. Alex highlights the importance of reaching out to all attendees of your webinar while you’re learning to get feedback on the content. It’s the perfect time to improve your offering. Lack of practice! According to Alex, a surprising number of people do not rehearse their presentation ahead of their first webinar. Presenting online in front of a live audience can be nerve-wracking the first time so it’s imperative that you prepare appropriately so you’re ready to go when it’s show time! Another challenge is not getting enough engagement. It’s important to draw your attendees into your webinar by asking open questions to the audience to engage them and get the conversation going. By starting that discussion you are much more likely to keep your viewers through your entire presentation. The final common pitfall is not following up after the webinar. It’s critical to email each attendee independently (when your audience size allows in the early days!) to ask for feedback. It’s the best opportunity to learn more about the customers and shape the webinar in the future. How do you engage with clients online? Every coach is different. Every client is different. The biggest advantage of working online is convenience. Allowing your clients to attend sessions with you from anywhere at any time. Using online conferencing software may force you to change the way you communicate and deliver content and training to your clients, but it also affords greater freedom of where your clients can be based, how they can feedback to you on the content you are producing, and how you can scale up your coaching business. Expertise.tv is a coaching platform that allows you to deliver coaching to your clients online. It also includes all the marketing and business tools you need to reach your potential clients, develop content for them to consume, create a community area where you can develop and nurture your relationship with them at scale. And from there convert those engaged audience members into clients through a number of monetization strategies. It includes a free webinar platform to test it out. Listen to the episode below and don’t forget to subscribe in iTunes!